Simply put, one of the best games of the year. Back in 2007, Valve Corporation released a value-packed collection called The Orange Box. While Half-Life 2 and its two episodic expansions were in the spotlight, the real highlight for most gamers was a short (2-3 hours) physics-based first-person puzzle game called Portal. Using a Portal Gun to create two-way travel points on many of the game environment’s walls, ceilings and floors, players solved a series of spatial orientation puzzles while a condescendingly maniacal A.I. named GLaDOS — think HAL with a female voice and a dry wit — guided them along. 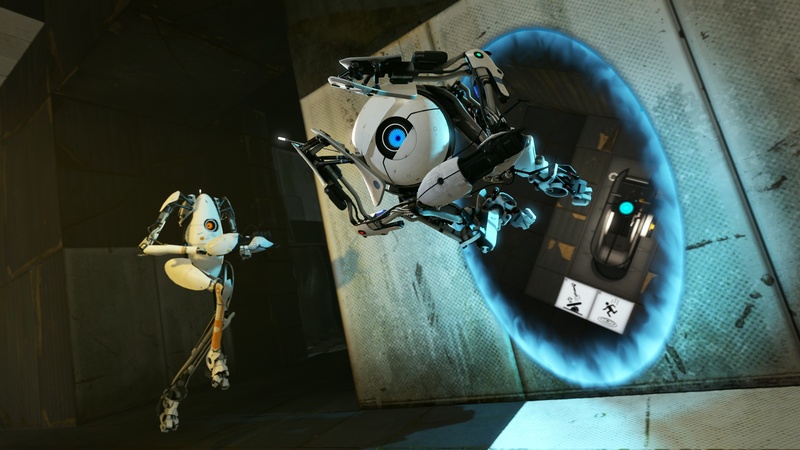 It was a hit–so much so that Valve went ahead and gave the game a full disc treatment for its sequel, Portal 2, which is now available in stores. Before we proceed, note that those who haven’t played through the first game and want to should stop reading here, as spoilers will be discussed. If you are one of those people, the short version of this review is: play the original and, if you like it, definitely get the sequel. Portal 2 picks up the story of the previous game’s female protagonist, Chell, after some significant amount of time has passed. The game begins with Chell waking up in what appears to be a bright and cheery motel room. A friendly voice guides players through the game’s basic movement controls in an amusing sequence which may or may not involve being told to appreciate a piece of artwork hanging on the wall. Chell then goes back to sleep and wakes up in a rundown version of the same room. There, she meets an A.I. named Wheatley (voiced by Stephen Merchant), who explains that she’s been asleep for a long time and offers to help her escape from the Aperture Science labs. The story unfolds from there, and the less you know about the specifics, the better. The Aperture Science facility fell apart in the days following GLaDOS’ defeat, and there are signs of decay everywhere as you make your way through a series of old testing rooms… and other areas. While some of this informs the gameplay, it mostly serves to establish a scene for the story, which is much more the focus of things in this sequel than it was in Portal. GLaDOS may have been taken down at the end of the first game, but, spoiler or not, you’re crazy if you think that such a notable character won’t be making a return in some form. Portal 2 is broken into two main play modes: the story-driven single-player campaign and the slightly less story-driven co-op campaign. On the solo play side, the basic rules are just as you remember them. There’s a Portal Gun that you can use to create a linked pair of holes that can be passed through. Not every surface can hold a portal, however, so a large part of solving each puzzle — all of which task players with making their way to and/or opening an exit door — involves figuring out the proper places to put these holes. It wouldn’t be a Portal game without Companion Cubes; they are back for the sequel, and they now come in multiple flavors to accommodate the new quirks introduced for the game’s puzzles. One Cube, for example, contains a spherical crystal which can be used to redirect the path of laser beams. You’ll also be using portals to redirect a few other new elements, such as gravity tunnels which carry you through the air in one direction, like a conveyor belt, and light bridges, which you can do more with than simply walk on. There is also a set of “gels” which can be applied to many of the game’s surfaces. You won’t carry gels in your inventory; they are puzzle-specific and often require proper portal placement in order to “paint” different parts of the environment. One gel works like a trampoline, another functions as a speed boost and yet another allows portals to be shot onto surfaces that wouldn’t otherwise accommodate them. What all of this amounts to is a very similar gameplay experience — you’re still running through a series of spatial puzzles — that fills your toolbox with a larger number of tools. On the whole, the puzzles demonstrate the same smart level design that characterized the previous game. They get progressively tougher as more new features are introduced, of course, but the overall challenge remains pretty consistent throughout. The game slows down a bit after the first hour or so, settling into the same rhythm introduced in the first game. It doesn’t last though; a break in the story eventually occurs. While the puzzle-solving remains fundamentally the same, the range of environments and your reason for being in them changes dramatically, and it all has a fresher feel as a result. Helping matters considerably is the same stellar writing that made the first game such a hit. Portal 2 is funny, no two ways about it. This game will make you laugh, frequently out loud and at length, even as it confounds you with hair-pulling puzzles to solve. That’s literally only half the game, however. Portal 2‘s single player campaigns runs for roughly 6-8 hours, and it’s co-op campaign runs for… 6-8 hours. The two narratives don’t run parallel to one another — frankly, the less said about how they link together, the better — but suffice to say, they are complementary. In the co-op campaign, two players take control of a pair of mobile A.I. units, P-Body and Atlas. 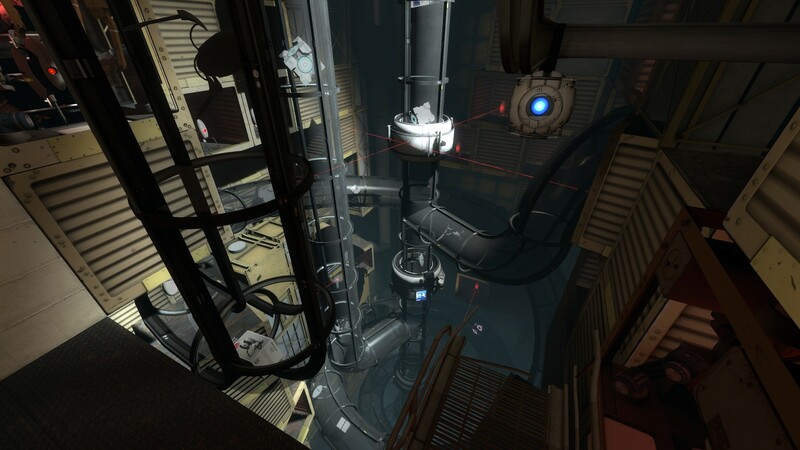 GLaDOS guides the duo through a series of tests, though the story also moves them out of the testing rooms at certain points to other areas of the Aperture Science facility. While the entire game is excellent, the co-op portion of Portal 2 has an edge over the single player mode, if only because the nature of the puzzles is so very different. These are all designed to be completed by two people, and there is a significant spike in difficulty as you progress through the five testing areas, each of which features eight testing rooms… plus a little more. The final set of testing courses is a standout, demanding that players call on everything they’ve learned in increasingly inventive ways. The only real downside to Portal 2 is how self-contained it is. With the exception of Achievements/Trophies, there is really no reason to go back and play again once you’ve completed everything. The puzzles never change and there’s typically only one, specific way to complete each one. That said, those 10-12 hours — assuming you have a friend to play through the co-op with — are well worth the $60 you’ll spend. There’s a Developer Commentary mode which allows players to access snippets of behind-the-scenes audio in various sections of the game, but it’s more of an interactive documentary — albeit an informative one — than a proper play mode. Any complaints are minor and are the result of reaching to find fault where there is in fact very little. Portal was an amazing title, and ground-breaking in many ways for expanding the idea of what is possible in a game played from the first-person perspective. Portal 2 sheds a little bit of that freshness — it is a sequel after all — but more than makes up for it with new twists to the established gameplay, a smarter set of puzzles and some of the best video game writing that we’re likely to see this year.